To the oppressed, the exiled, the enslaved, the persecuted of the first century this had to be “good news” or even GREAT news, just as the angel announced. A king had been born that would one day free all from those forces that held them captive. That night an earthly king was born to Jews, but to us, who have come to follow Jesus, someone far different. We who believe in Jesus, and honor him with the title “Christ”, picture a leader with a broader and more enduring role. More than a savior. Our English word “Savior”, in most translations of the Bible, is from the Greek word Soter. An alternative translation of Soter is “healer”. That may not seem to be all that significant, but it does make a difference when you consider when the savior’s work is effective. For many, salvation is all about eternal life, the promise of heaven, or sometime after our death. The good news about healing is that it begins in the here and now and addresses deeper systemic issues. In a recent On Being podcast host Krista Tippett interviewed Dr. Rachel Naomi Remen, MD. She is an Oncologist who has lived with chronic illness and helped many move beyond their physical suffering. She stated, “We thought we could cure everything, but it turns out that we can only cure a small amount of human suffering. The rest of it needs to be healed, and that's different.” God sent Jesus to earth to realign creation’s relationship with God and to heal the broken rather than fix a problem. He came to give us life beginning now. The timeliness of God’s work on our behalf then gives us freedom and releases us from those things that prevent us from serving our neighbor in our current context. We are healed to heal. This Holy Holiday please join me in praying that we might all come to know the Healer sent to the world, and through that knowledge commit to seek a wholeness of life for all we meet. 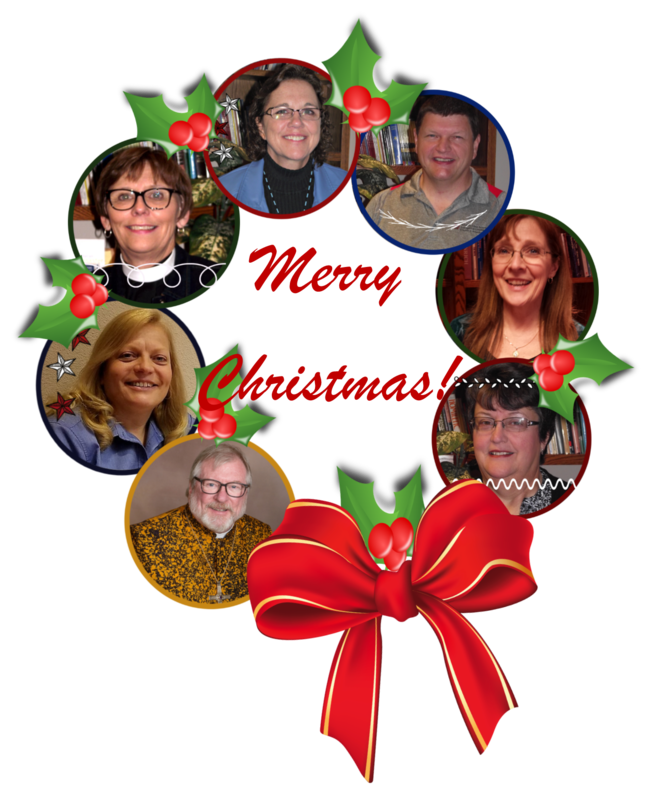 The Western Iowa Synod Leadership Team wish you a Merry Christmas and a Blessed New Year. Leadership Team members from the bottom left up and around: Bishop Rodger Prois, Deacon Lynn Egesdal, Pastor Lorna Halaas, Cindy Wells, Pastor Jeff Ungs, Julie Cook and Kay Broich.